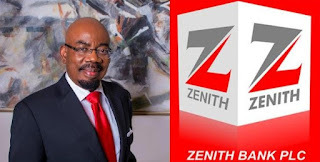 During his interview with Bloomberg TV at the weekend, on his new book, ‘Africa Rise And Shine: How a Nigerian Entrepreneur from Humble Beginnings Grew a Business to $16 billion,’ the Chairman of Zenith Bank Plc, Mr. Jim Ovia urged entrepreneurs to be responsive to opportunities lurking around. He urged promising entrepreneurs not to be discouraged by non conducive environment for business due to political instability they might be going through in Africa. Specifically, Ovia advised foreign investors not to be deterred by negative news and commentaries about Africa. He explained: “We started the business with N20 million at an exchange rate of N5 to a dollar. So, we actually started the business with $4 million in 1990, and it has now blossomed. “So, you could imagine the tremendous opportunities that existed in Nigeria and some other African countries, but because we were indigenous people, we knew that, that meant nothing. When asked if he was worried about the level of non-performing loans (NPLs) in the banking industry, the Zenith Bank founder said, “NPL is something that banks worry about anywhere in the world, whether it is in the United Kingdom, in Africa or the US, there are NPLs. We don’t necessarily worry because it depends on how you are able to hedge against some of those risks.